We believe there’s a healthy and humane way to raise pork. 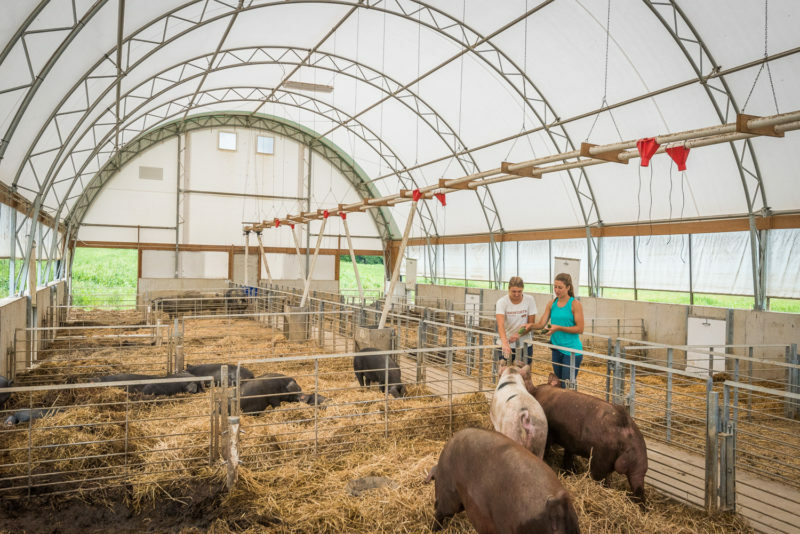 When we built our state-of-the-art pastured hog facility in 2015, we wanted to create a scalable model for other farmers looking to raise hogs the right way. The facility and its eight acres of surrounding pasture serve as our laboratory. There, we’re investigating best practices for raising hogs in a way that benefits the farmers, animals, and the land. 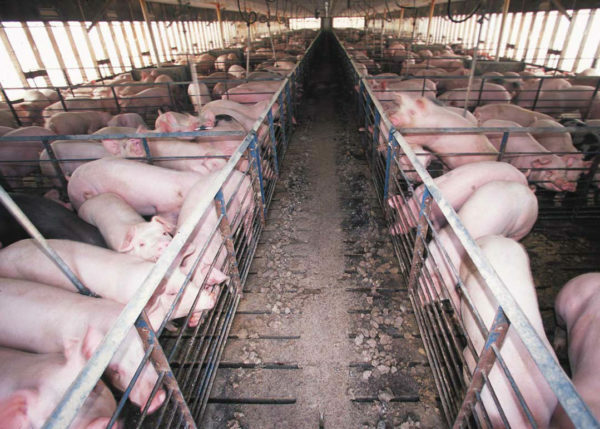 97% of commercial hogs are raised in small, indoor, concrete-floored pens. Almost half are raised on Concentrated Animal Feeding Operations (CAFO), also known as factory farms. These intense operations lead to overcrowding, animal stress, disease, and excessive waste. The United States is one of the largest producers of this kind of conventional pork, second only to China. We developed our facility and research on pastured pork because we believe animals can be raised another way—one that results in a healthier product for people and the planet. Pastured animals are free to express their natural behaviors. They’re less stressed and get along better with each other and with handlers. Grazing animals help regenerate pastures when managed properly. Animals consume or trample weeds, and their manure is a valuable fertilizer. Pigs that forage have access to a diverse array of plants and insects that keep them healthy and entertained. Pigs are smart and need variety. 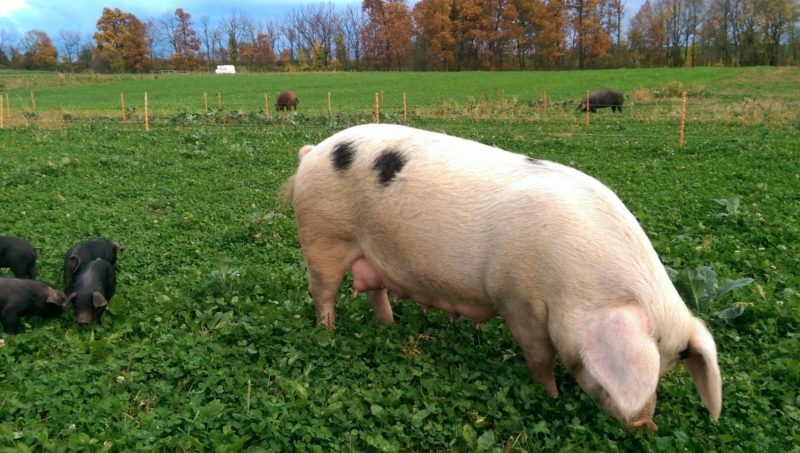 Grazing on pasture means pigs need less feed, which tends to be an expensive input. How can we reduce the impact of pig parasites? How much pasture are the pigs consuming? How much feed is the pasture saving? How frequently do the animals need to be moved? How can we minimize land degradation? Our goal is to help current and future hog farmers determine the best type of pasture for raising hogs, the best paddock size, and best practices for maximizing the regrowth of forage crops. 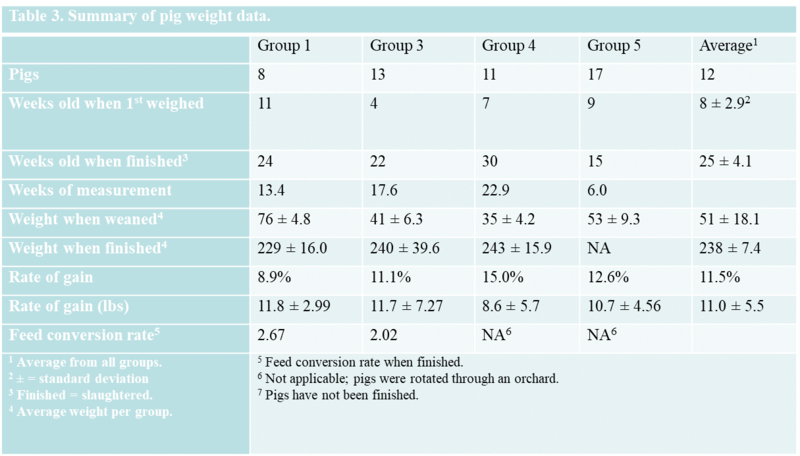 Summary of pig weight data. Note Group 5 was not yet finished. Click to enlarge. Left: Percent weight gain over time. Right: average hog weight over time. Click to enlarge. Most hogs today are bred for confinement. We raise heritage breeds instead, which are sturdy and well-suited to life on pasture with a strong genetic impulse to forage. They’re also increasingly threatened as conventional methods have become the norm. 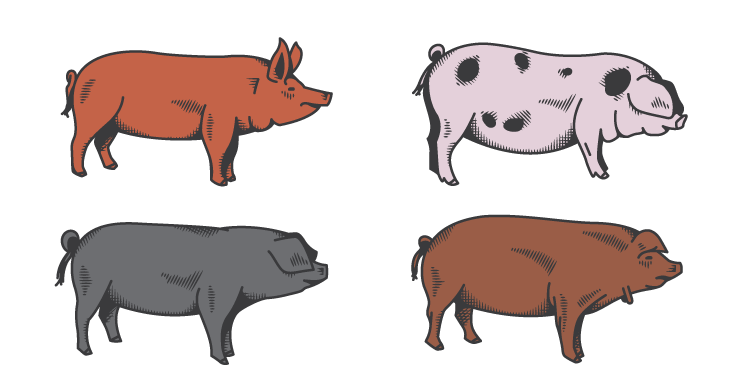 Currently, our breeds of choice include (clockwise from top left) the Tamworth, Gloucestershire Old Spot, Red Wattle, and Large Black. For more information on heritage breeds, visit LivestockConservancy.org. 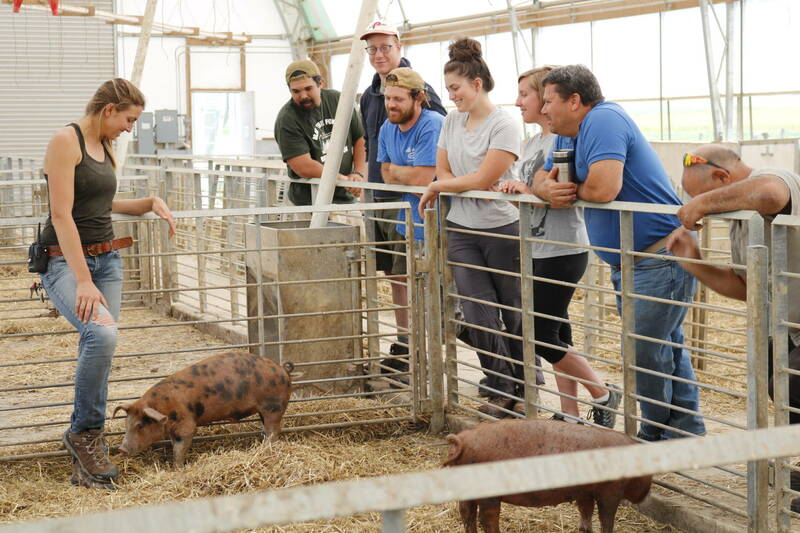 New farmers in training assist with data collection and learn about pasture and livestock management at the hog facility.